blogging for windsor again today and talking about more of my summer favorites- of course including maxi skirts and lightweight chic tees like like comfy v-neck with the leather detail sleeves! i also rocked the camo vest in this post for a little "pattern play". head over to windsor's blog to read a little more and see more photos! I love this look! I have an obsession for maxi dresses and skirts!! I've bought a few maxis from Windsor, and they seem a little thin. Do you wear a slip under yours? P.s. I love your blog! It makes my day! Love this look! So so pretty! 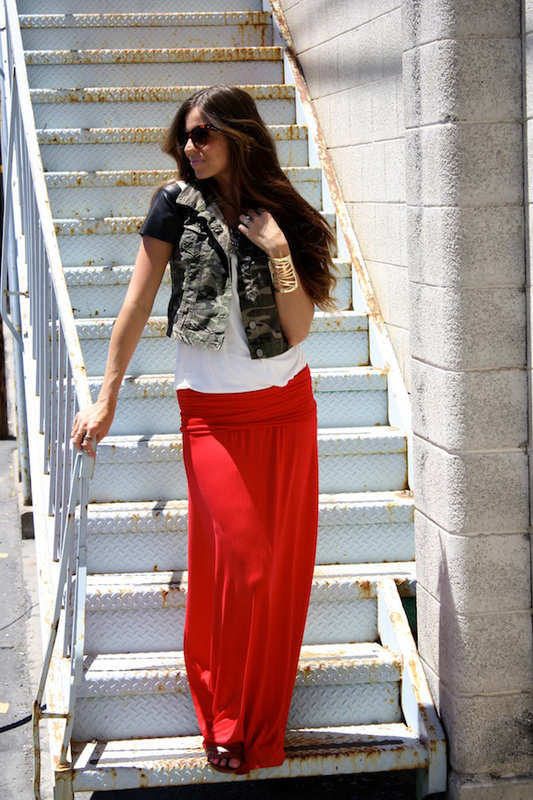 Love this the combination of camo and red, chic. I love this cuff and the color of your skirt!